Would you like to bring gestures to the Music.app to easily switch back and fourth between songs? Well, if you would then you will be glad to know that a Cydia tweak, dubbed Swipe Navigation for Music was recently released to do just this. With the Swipe Navigation for Music Cydia tweak you can swipe back to go to the previous song and swipe forward to go to the next song. This is all the tweak does, and will be perfect for those of you who are to “busy” to configure something similar through Activator. Note: The Swipe Navigation for Music Cydia tweak does not have any configurable options and no icons are added to your SpringBoard. 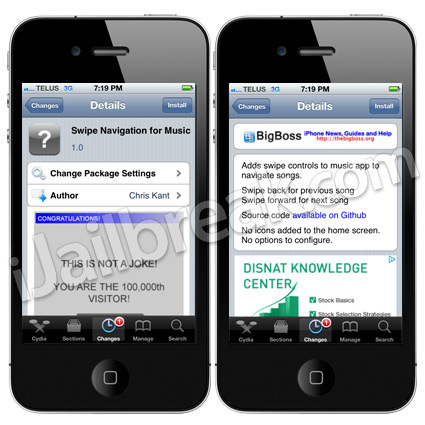 If you are interested in the Swipe Navigation for Music Cydia tweak you can find it through Cydia via the BigBoss repo for FREE. Let us know what you think of this tweak in the comments.